"Enjoy a Healthy and Fun Bicycle Ride through Beautiful Sun City West"
Come ride with us! We welcome all levels of riders, from conversational pace to fast pace. We are the cycling club of Sun City West! All cyclists welcome. The Sun City West Cyclists gather at the Echo Mesa golf course parking lot every weekday morning. Times for these morning rides vary with the season, so check our Events Calendar for the current time. The rides are divided into several groups and we try our best to assign new riders to the group appropriate for them. The rides last for an hour with a rest stop, usually at a recreation center or golf course, half way through the ride. Longer and faster riders have additional options. After the ride we all meet back at Echo Mesa for social time on the patio. Join a trial ride with us! You are welcome to just show up at Echo Mesa for a morning ride. Requirements for joining the club are a current Sun City West recreation card, a bicycle and helmet and $3.00 for annual dues. We are a robust group. We have club rides off campus, including monthly rides at South Mountain Park, and we have fun rides, like our Sunday Sundae rides or our Holiday Lights Ride. We go off campus every month, and we just added adventure weekends to the mix. We also have frequent social events, charity and community events, and we join other cyclists in cycling events across the region. If you like to ride, you will love to join SCW Cyclists! 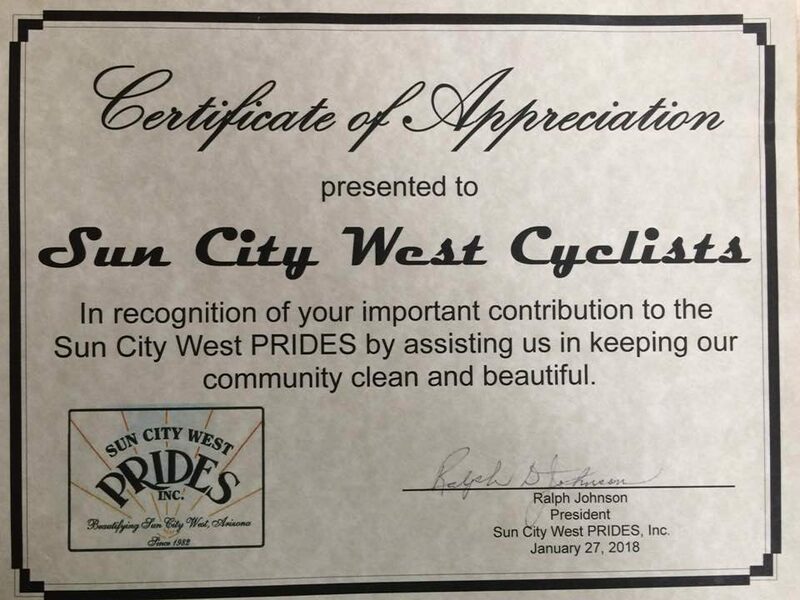 The Sun City West Prides presented the Cyclists with a certificate of Appreciation at their February meeting. Acknowledging the SCW Cyclists for their contribution to the community on January 27, 2018, Prides President Ralph Johnson thanked the club for the support and said the Prides look forward to a continued partnership. Lori Schroeder and Alan Schlemmer were on hand to accept the certificate and to thank the Prides for all they do to keep Sun City West a beautiful place to ride and live. Our next Prides Partnership Day is Saturday, March 24,2018.